I travelled to Oshitenda, an informal settlement on the outskirts of Windhoek, the capital of Namibia to obtain baseline information on existing water and sanitation-related hygiene practices in their cultural, social, economic, and physical context. 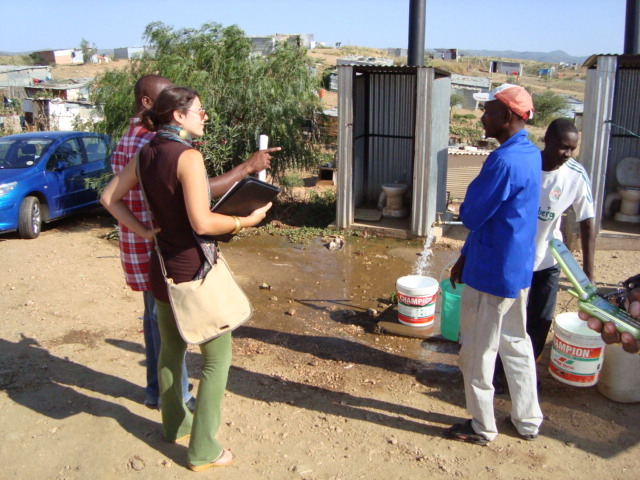 This research was carried out in order to develop a successful hygiene promotion intervention for the city’s informal settlements based on community values in an effort to reduce the high rate of diarrhoeal diseases in these areas. Diarrhoea is the second most common reason for paediatric admission in Namibia and the third most common cause of adult hospital admissions from 2002 to 2005. Diarrhoea is second only to HIV/AIDS as the most common cause of death in all age groups in the country. I stayed for 12 weeks reporting to the Chief of the Health Services Division of the city’s Municipal Government (The City of Windhoek). The project was guided by a multi-disciplinary steering committee specialising in water and sanitation management called the WATSAN Committee. The methods used include structured interviews focus group discussions, and direct observation of the environment and within the households. The main complaint from the survey respondents regarding the existing Enviro-loo toilets are that they give off a foul smell and are dirty. These are followed by complaints about the lack of maintenance and dissatisfaction with the location of the facilities. 100% of survey respondents (then entire community) practices open defaecation. It is hoped that the results of this formative research have served to inform the City of Windhoek about the current practices and beliefs of the Oshitenda community. Of course, a comprehensive monitoring and evaluation plan must be launched along with the hygiene programme in order to ensure that it is effective in accomplishing the desired deliverables.